bankmecu continued to deliver products and services that satisfy our customers: 90% of customers said they were satisfied. However, satisfaction is lower than in previous years (93% in 2013; 94% in 2012), largely reflecting dissatisfaction with the current low interest rate environment for depositors. bankmecu recognises our customers’ needs change as they move through different stages of life. We monitor satisfaction at different life stages. 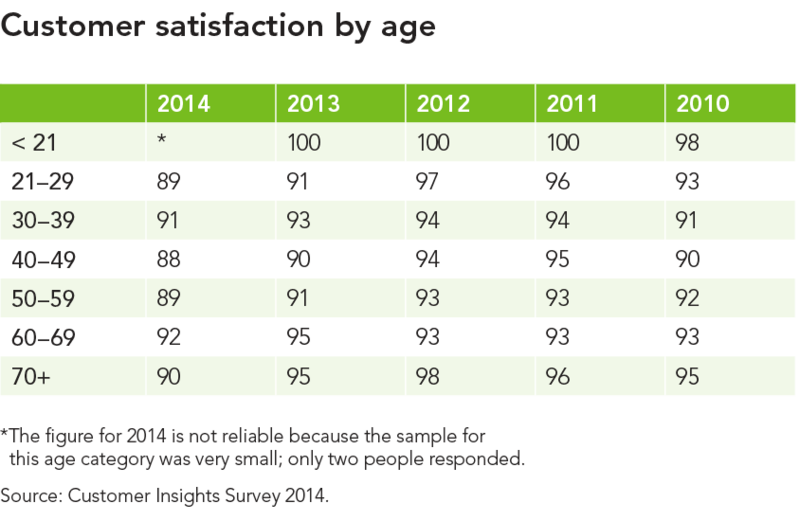 Satisfaction remained high in all age categories, although all categories recorded a fall compared with previous years. Customer loyalty was high, as measured by our Net Promoter Score. This is determined by asking customers how likely they are to recommend the Bank to others on a scale of 1 to 10; it is then calculated as the percentage of promoters less the percentage of detractors. bankmecu scored +38% in 2014, more than double our score in the previous year. It also compared favourably with the average score of the four major banks, which was –15.5% in 2013.